Refresh the page to see your new currency. If your delivery address is NOT in the U.S.A. or Canada please CLICK HERE. Purchase this as a Digital Download. Your downloads will be links in an e-mail message sent to the e-mail address you supply. Click on those links to download each track you purchase. Please ensure that your e-mail program will accept e-mails — with live links — from tom@tomlewis.net, and that such e-mails will NOT be automatically diverted by a "junk" or "spam" filter. 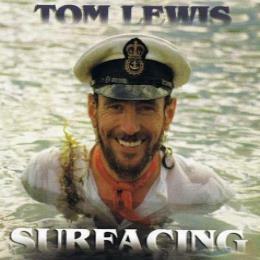 Surfacing includes the 13 songs listed below; I've quoted Tom's (often amusing) liner notes for each. Click on to listen to a sample of the song. Click on the song title to see the lyrics. A Sailor Ain't A Sailor (Last Shanty) "My first song, written when I was only 33 and didn't know any better". Recall "Blue Peter, International Flag 'Papa', is hoisted on merchant vessels to signify imminent departure and to recall the crew. Inspired by Stan Hugill, who is not God -- he just looks like him." Inside Every Sailor (Deceptions) "Who is so perfect as never to have practised self-deceipt?" Sailorman's Port in a Storm "Please feel free to adapt and augment at will -- just like 'real' shanties." Watches "A hairy-chested sailor will tell you that each hair was grown, one at a time, on the middle-watch between 2359 and 0400." And the Hunter Home from the Hill "A song based on Robert Louis Stevenson's poem 'Requiem'." Landlocked Sailor "This is what moving to North America does to a nautical songwriter." Marching Inland (Legend) "The philosophy underlying this song can be found in Homer's Odyssey. In Britain, however, it is impossible to get 100 miles from the sea." Away "Lyn knows that this one is for her." Bread and Butter to Me "Did you notice that there were no personal invitations issued to join the Falkland's conflict?" Diesel and Shale "Despite hearing this cautionary tale of Cyril Tawney, I still spent 17 years stinking of submarine fuel and lubricating oil." Cyril Said It All Before (Post Tawney Blues) "Cyril Tawney is unique! In the Fifties and Sixties he sailed 'single-handed' to the New World of Contemporary, nautical songs, pioneering where the rest of us can only aspire to follow." Sailor's Prayer "The frontispiece of Charles McHardy's authentic submarine novel: Send Down a Dove, is a traditional sailor's prayer, and forms the chorus of this plea for divine intervention.